Join our popular Aerobic Classes at Clayton Fitness and get fit with a group who all has the same goal — have fun, fight fat and get fit. Our friendly, certified instructors will easily lead you through each step with expert cueing. Your new friends are waiting for you! CARDIO BOOTCAMP Get in shape “boot camp” style! Experience high-intensity, full-body workouts that target the major muscle groups of the upper & lower body, specifically designed to “make it rain” sweat! From circuit-style routines that jump-start cardio fitness, to creative muscle-toning exercises using dumbbells, exercise bands, or even the participant’s body weight, each class brings its own unique challenges. No two classes are the same! Students will work the quarter to improve cardiovascular stamina, core strength, & flexibility. ﻿YOGA A Hindu spiritual and ascetic discipline, including breath control, simple meditation, and the adoption of specific bodily postures, which is widely practiced for health and relaxation. A regular yoga practice will help transform both your mind and body ultimately helping you find an inner calmness/peace, enhance your balance and stability, and leave you feeling stronger and more centered. 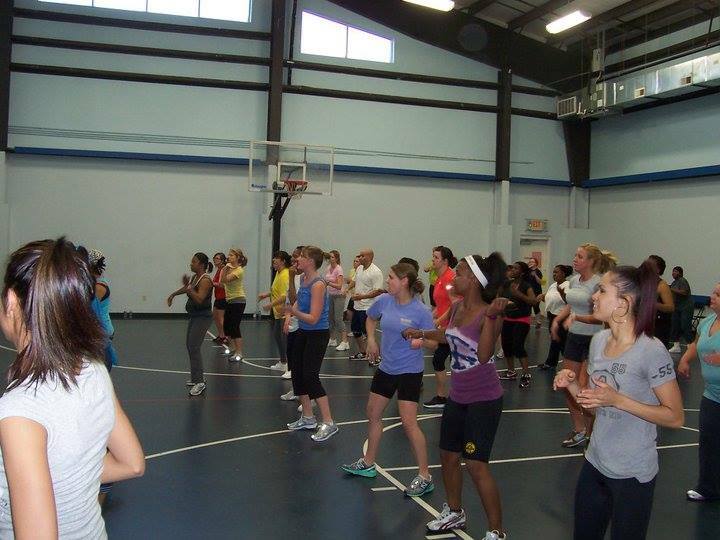 ZUMBA This workout is a dynamic fitness program using Latin dance flavor. Come experience the exhilaration of moving your body to the rhythm of the music! This class features easy-to-follow moves in interval training sessions with fast and slow rhythms, stretching, and most importantly FUN! CYCLE See consistent results while burning a high amount of calories and improving cardiovascular endurance in this non-impact class. Whether you're a beginner or avid cyclist this class is for you - it's modified for all levels! Instructor focuses on fun and challenging rides with steady progressions towards the end of each format. Different rides include but are not limited to intervals, strength, split rides, race day, combo & variety. Come and enjoy the interaction, driving energy and beats from fantastic music and get one of the best cardio workouts you can do in a group exercise setting. BODY BLAST This class allows individuals to train for improvements in everyday real life activities. Through the use of hand weights, real life functional movement patterns such as twisting, bending, pushing, pulling, lunging and squatting are executed in a FUN and creative way. You will walk away feeling more confident and ready to take on daily activities with more energy. Core training, balance and flexibility are all included to create a total well rounded program. SilverSneakers Classic Have fun and move to the music through a variety of exercises designed to increase muscular strength, range of movement and activities for daily living. Hand-held weights, elastic tubing with handles and a SilverSneakers ball are offered for resistance. A chair is available if needed for seated or standing support. SilverSneakers Circuit Combine fun with fitness to increase your cardiovascular and muscular endurance power with a standing circuit workout. Upper-body strength work with hand-held weights, elastic tubing with handles, and a SilverSneakers ball is alternated with low-impact aerobic choreography. A chair is used for standing support, stretching and relaxation exercises. SilverSneakers CardioFit Get up and go with an aerobics class that’s safe, heart-healthy and gentle on the joints. The workout includes easy-to-follow low-impact movement and upper-body strength, abdominal conditioning, stretching and relaxation exercises designed to energize your active lifestyle. SilverSneakers Yoga SilverSneakers Yoga will move your whole body through a complete series of seated and standing yoga poses. Chair support is offered to safely perform a variety of seated and standing postures designed to increase flexibility, balance and range of movement. Restorative breathing exercises and final relaxation will promote stress reduction and mental clarity. Copyright 2019 Clayton Fitness All Rights Reserved.